Showing 1 - 20 of 281 results. 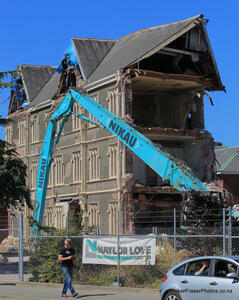 A photograph captioned by BeckerFraserPhotos, "The partially-demolished Christchurch School of Music on Barbadoes Street". 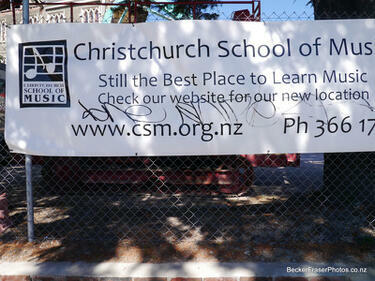 A photograph captioned by BeckerFraserPhotos, "A sign for the Christchurch School of Music on Barbadoes Street". Photograph captioned by BeckerFraserPhotos, "A view of SOL Square from the top of the Alice in Videoland building on the corner of High Street and Tuam Street". 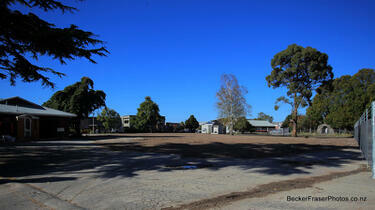 Photograph captioned by BeckerFraserPhotos, "The site of the Christchurch Music Centre on Barbadoes Street". 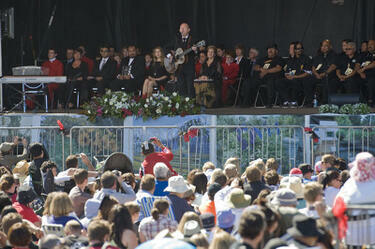 Dave Dobbyn performing at the Christchurch Earthquake Memorial Service in Hagley Park. 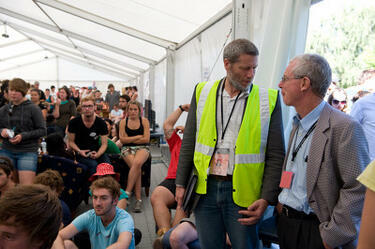 University of Canterbury Vice-Chancellor Rod Carr speaking with UCSA President Kohan McNab and former Chancellor Rex Williams, inside the UCSA's "Big Top" tent. 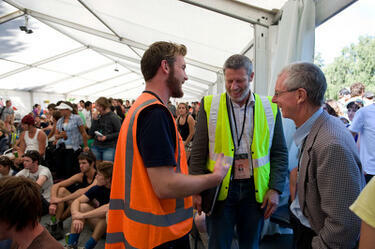 The tent was erected in the UCSA car park to provide support for students in the aftermath of the 22 February 2011 earthquake. Around them students have gathered to watch a local musician play. The student have spent the day clearing liquefaction from Christchurch properties as part of the Student Volunteer Army. 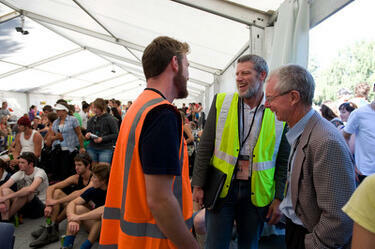 University of Canterbury Vice-Chancellor Rod Carr conferring with former Chancellor Rex Williams, inside the UCSA's "Big Top" tent. The tent was erected in the UCSA car park to provide support for students in the aftermath of the 22 February 2011 earthquake. 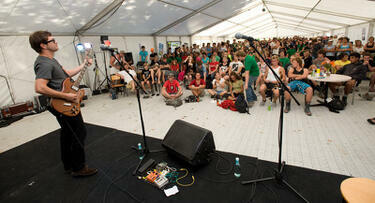 Around them students have gathered to watch a local musician play. The student have spent the day clearing liquefaction from Christchurch properties as part of the Student Volunteer Army. 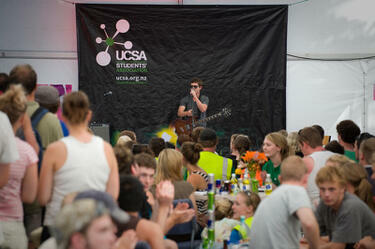 A local musician entertaining University of Canterbury students inside the UCSA's "Big Top" tent. 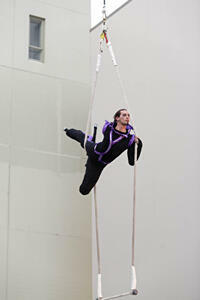 The tent was erected in the UCSA car park to provide support for students in the aftermath of the 22 February 2011 earthquake. The students have spent the day clearing liquefaction from Christchurch properties as part of the Student Volunteer Army. 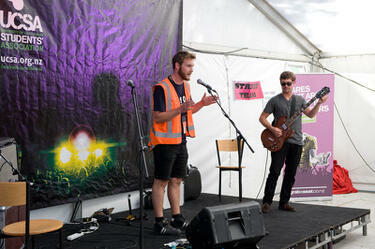 UCSA President Kohan McNab addressing students at the University of Canterbury inside the UCSA's "Big Top" tent. The tent was erected in the UCSA car park to provide support for students in the aftermath of the 22 February 2011 earthquake. The students have spent the day clearing liquefaction from Christchurch properties as part of the Student Volunteer Army. 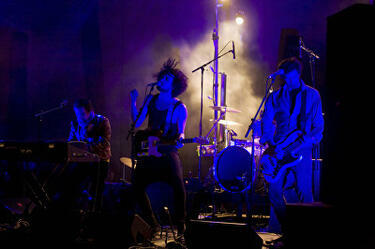 To the right of McNab, a local musician who has been entertaining the students can be seen. 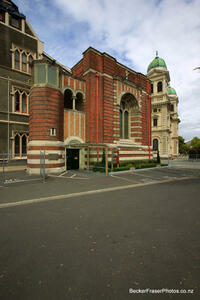 The entrance to the Music Centre of Christchurch building on Barbadoes Street. 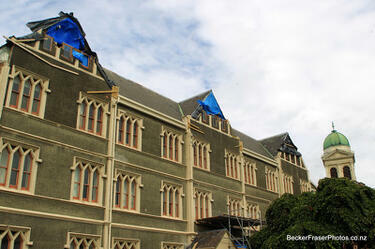 Damage to one of the gables of the Music Centre of Christchurch building on Barbadoes Street. 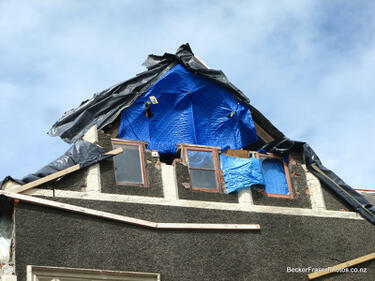 The gaps left by the collapse of the building's masonry have been weather proofed with a tarpaulin. 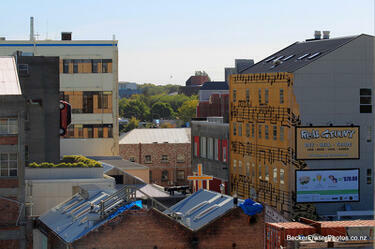 Damage to the Music Centre of Christchurch building on Barbadoes Street. 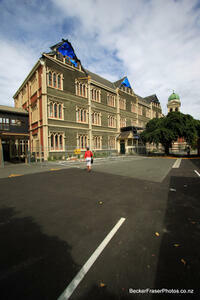 Tarpaulins have been used to weather proof gaps in the building's gables from where masonry has fallen. Damage to a gable of the Music Centre of Christchurch building on Barbadoes Street. 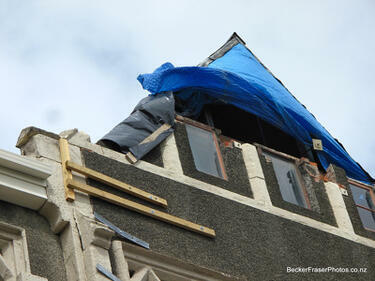 The gaps left by the collapse of the building's masonry have been weather proofed with a tarpaulin.